With our reconditioning tools, proprietary paints and clearcoat process, we can remove curb rash, scrapes, gouges and discoloration caused by age. 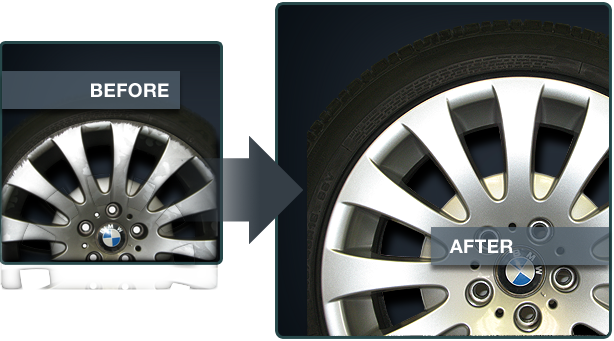 It’s a specialized process that ensures a match with the undamaged wheels. There are many variations of standard silver wheel finishes depending on the concentration of metallic within the paint. More metallic generally gives off a brighter finish, while less metallic yields a flatter finish. There is also a class of finishes known as hyper silver. Your Kwicksilver professional is highly skilled in matching all these finishes. Polished aluminum wheels can also be brought back to like-new condition.